Monica Bellucci and David Wenham co-star in this Australian sci-fi horror comedy about soul-sucking demons declaring war on the human race. A man who discovers that he is part of a secret sect of magical beings who hunt down and destroy demons in the internet. 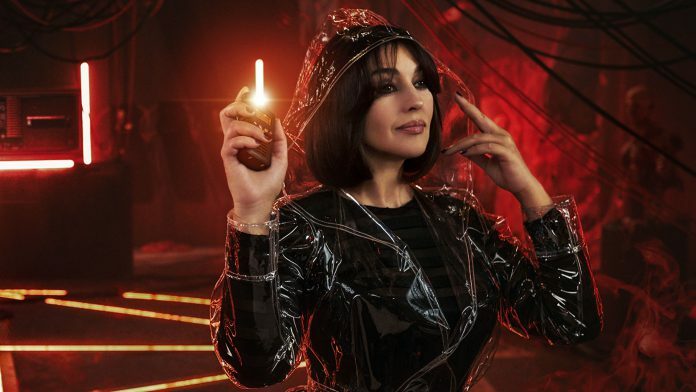 Produced by Andrew Mason and Troy Lum for Hopscotch Features and Tristan Roache-Turner for Guerrilla Films, the film stars Monica Bellucci as Finnegan, CEO of the sinister Daemokon corporation, who is determined to feast on every human soul on the planet via a new smartphone app. Something wicked lurks in the dark depths of the internet in Nekrotronic, a cheerfully pulpy horror comedy from Australian producer-writer-director duo Kiah and Tristan Roache-Turner. The brothers earned positive critical notices with their 2014 feature debut Wyrmwood, a lo-fi splatterpunk cocktail of killer zombies and Mad Max future-shock. Their follow-up project boasts a bigger budget and more famous cast, including Monica Bellucci and David Wenham. But this bloodthirsty comic-book fantasy is let down by its infantile humor and derivative, incoherent plot. Fantastical story elements and tongue-in-cheek humour, this is a crowd-pleasing genre-mashup that only gets more insane as it builds to its blood-soaked, head-exploding finale. Ben O’Toole and Epine Bob Savea play waste disposal workers who find themselves caught up in the conflict between Finnegan and a trio of Nekromancers: Luther (David Wenham) and his daughters Molly (Caroline Ford) and Torquel (Tess Haubrich). But when O’Toole’s character discovers an unexpected connection with Finnegan, he unwittingly becomes humanity’s last and best hope for salvation.